There is a school in Chicago where students are introduced to stocks in kindergarten and trade stocks by the fourth grade. 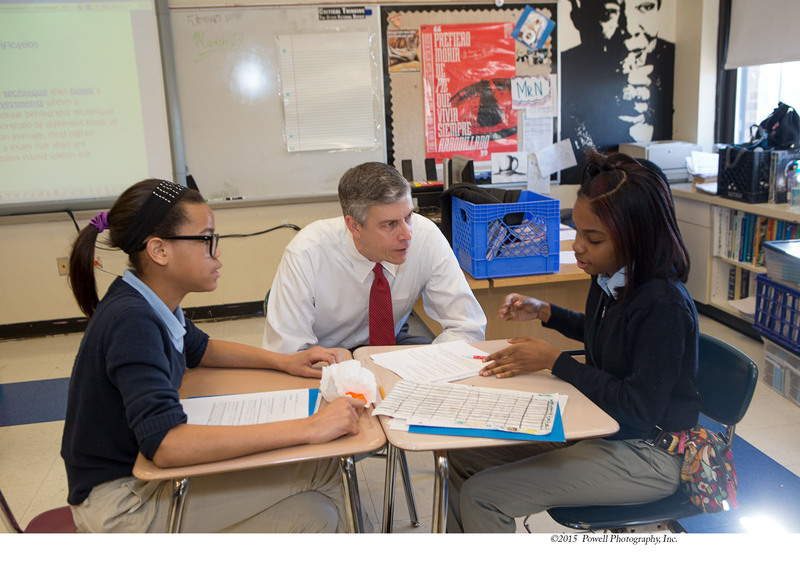 Ariel Community Academy is a public school on Chicago’s South Side — the vision of John Rogers, founder, chairman and CEO of Ariel Investments, and Arne Duncan, former U.S. secretary of education. Rogers founded the school more than 20 years ago. Among the graduates are doctors, lawyers, entrepreneurs and, of course, investment bankers. Here’s how Ariel Community Academy works, according to principal Lennette A. Coleman and former students. The school goes from kindergarten through eighth grade, each with two classes of approximately 25 students. Three instructors are dedicated to teaching financial literacy: one at the primary level, one at the intermediate and one for middle school. The rest of the curriculum is similar to any other grade school, with classes in math, science, fine arts, music and technology. And they have a “dynamite baseball team,” Coleman said. Financial education starts in kindergarten and the first grade, where they learn the very basics about economics and personal finance. “They learn about saving money and spending money,” said Coleman. “The instructors use a curriculum that is age-appropriate. “They are taught about wants and needs, and the difference between those things,” she said. “We may look at the fact that the cost of a bike is $200 and the average person makes $400. By the third grade, the students begin to learn about stocks, bonds and curriculum. “In the fourth grade, they begin to learn about portfolios, picking and managing stocks, as well as entrepreneurship and creating business plans,” Coleman said. Students start in kindergarten with the $20,000 originally contributed by Ariel ($10,000 for each of the two classes in the grade). In the early years, the portfolio is managed by Ariel and Nuveen Investments. By the later grades, the students are actively involved in making the investment decisions. A Junior Board of Directors (composed of sixth-, seventh- and eighth-grade students) decides how to invest the money until they graduate. By eighth-grade graduation, that portfolio has grown. The original $20,000 goes to the following year’s kindergarten class to start the process all over again. The surplus, or profit, is divided. Half is donated back to the school. The other half goes to the students in the graduating class. The average profit is $12,000 to $13,000, although it has been as high as $32,000, Coleman said. If the student uses his or her cut of the profits to open a college savings account, Ariel will match it with $500. “Ninety percent of the students opt for the savings account and get the match from Ariel,” she said. One of those students was Victoria Bills, who started at the school in the sixth grade. By the eighth grade, she was head of the investment committee. She went on to the University of Chicago Laboratory High School on a John Rogers scholarship, and later Babson College in Boston. Today, she works at Ariel in institutional sales. Mario Gage is another graduate. His mom enrolled him in the school in the second grade because she loved the concept of financial literacy. She enrolled Gage and later his brother Miles, who is two years younger. 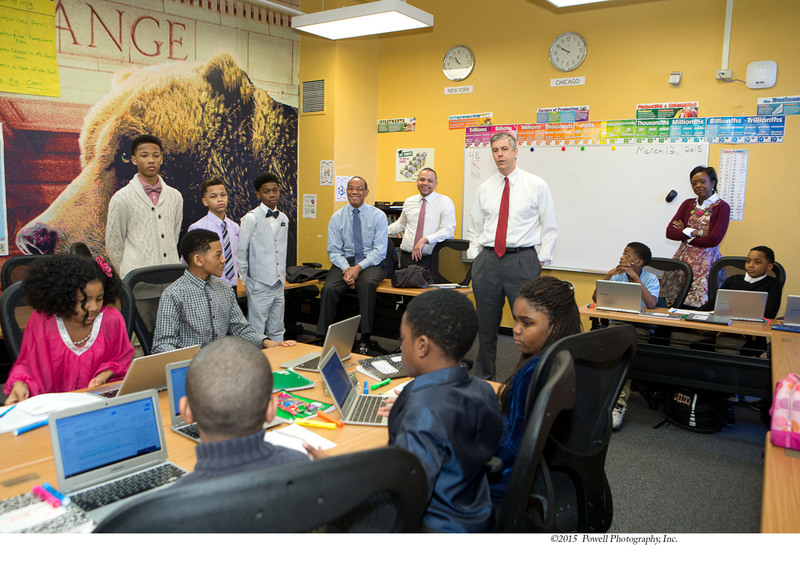 Ariel Community Academy students in the classroom with Ariel Investments chairman and CEO John W. Rogers Jr. (left, in blue shirt and tie), city of Chicago treasurer Kurt Summers (center) and Arne Duncan (right), managing partner of Emerson Collective. His class’s profit was $14,000, which left $7,000 to be divided among the graduating eighth-graders. Among the highlights of Gage’s time at Ariel, he said, were field trips to the Federal Reserve Bank of Chicago, Ariel Investments and the McDonald’s annual meeting. He also joined a youth investment club outside the school, one exclusively for African-American youths ages 12 to 18. Gage’s mom, Michelle, a human resources director, said she has always talked finances with her sons. “When they grew older, they started teaching me. When Gage graduated from Ariel Community Academy, he also received the John Rogers Scholarship to attend the University of Chicago Laboratory High School. He graduated from the University of Chicago with a degree in economics and went to work for Ariel Investments. He now travels and lectures on financial literacy and assists Ariel with its financial literacy initiatives. Rogers said the concept for the school started 20 years ago when Duncan worked at Ariel coordinating community affairs. His first project was the I Have a Dream Class, which he borrowed from a program at New York City, in which a class was adopted with the promise of making college affordable for the students. The idea to focus on financial literacy came after Rogers attended a conference with personal finance journalist Jane Bryant Quinn and former U.S. Securities and Exchange Commission chairman Arthur Levitt. They talked about the need for more financial literacy in schools, especially public schools. He immediately called Duncan, and Ariel Community Academy was born.